I received this portfolio as a gift from a great friend whom I work with. The portfolio is very professional looking and very durable. I was in search for a portfolio because mine was stolen from my vehicle. I had looked around at several places and just couldn't find the right one. I was talking with my friend about where to buy a nice leather portfolio and low and behold one arrived on my desk about 3 days later. Perfect gift from a very thoughtful friend. The craftsmanship of this portfolio is excellent. Colors are rich and very professional. I have bought two as gifts, and they are both well loved and used frequently. A little expensive, but you are paying for quality and durability. 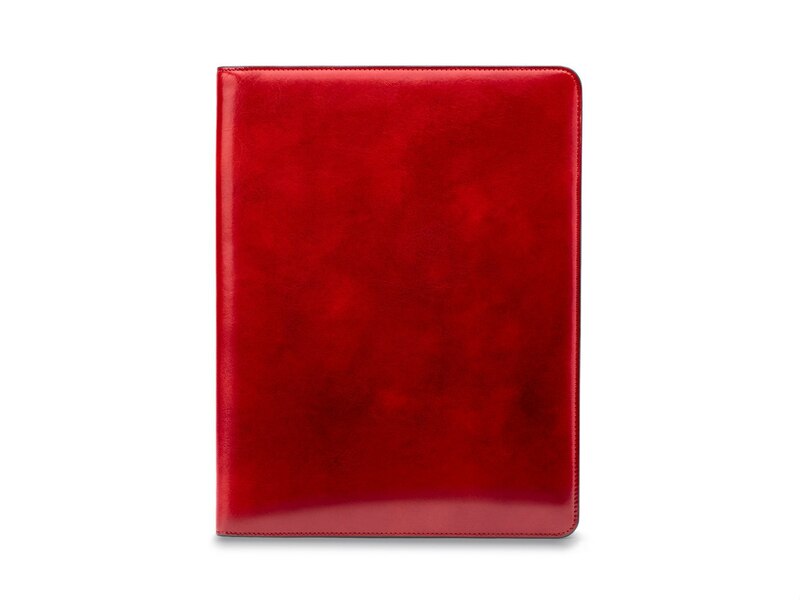 Beautiful executive portfolio, high quality leather, rich color (cognac)! I recently purchase this writing pad as a graduation gift for my husband. He loved it! The leather, textured, and overall beauty of the product was tasteful. As a business professional this will be the talk of the table. Thank you so much! I received one of these portfolios--the exact same one--for Christmas in 1988. I'm an attorney and I have used this thing nearly every day for almost 30 years and it hardly looks worn. Leather and all stitching is in great shape. I may have oiled it once or twice since 1988. Can't say enough about the quality of this product. In the 1990s I had a Bosca padfolio that I took EVERYWHERE with me in my job as a Sales Manager in Manhattan, NYC. On sales appointments, to meetings, etc. The quality was top-notch, the single paper holding slot on the left side is perfect, as is the business card holder on the bottom left inside. I recently purchased this Old Leather Padfolio in Black and it is PERFECT! The look, the functionality, the professionalism, and the top-quality leather feel. Thank You, Bosca...and keep creating these upscale top-notch quality leather products. 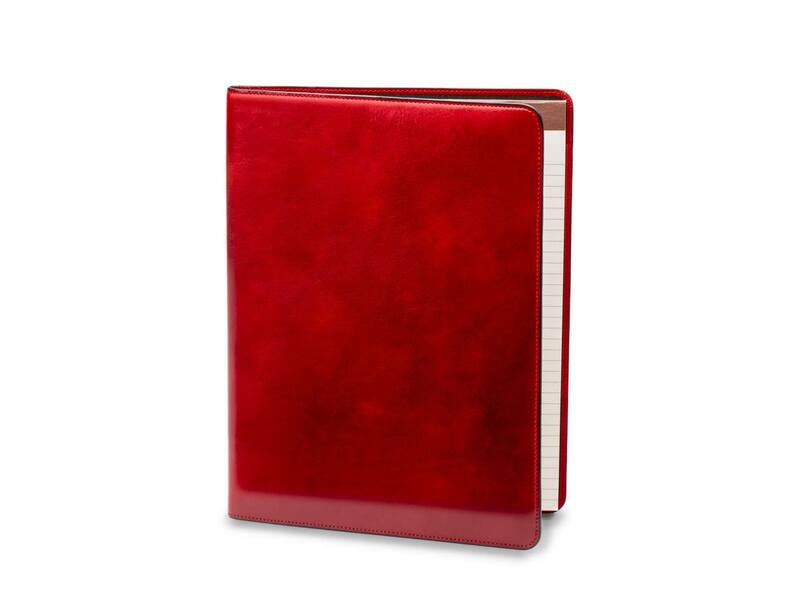 Any chance you'll ever introduce this Padfolio in a 6" x 9" size (to accommodate a 5" x 7" pad?? I'd love to add something like that to my professional repertoire. I have to be honest here and this may be nitpicking, you can decide. Although the leather and workmanship are very nice (this replaces one I bought over a decade ago), there were several observations: 1) the inside lining has been changed from the original (still shown on the website) to a shiny, textured looking cloth 2) the outside hard finish scratches very easily, mine after 2 weeks of careful use (it has it's own shelf space) has multiple scratches from sliding around the car seat or carrying next to my cellphone 3) the inside clear plastic business card holder has a leather spec baked (?) into the inside plastic and could not be cleaned off (without indenting the plastic) and can be noticed against a white business card. It must have happened during manufacturing 4) the business card holder holds maybe 4-5 cards 5) the pen holder is much larger but a z-grip type pen makes the case a bit harder to close 6) my monogram arrived with a lowercase 3rd letter even though the web order monogram showed all 3 capital letters. This was explained to me as a system error and the shop quickly replaced the product for me. I recently purchased a couple of men's brief cases from Bosca and have been very impressed with their service and attention to detail. The writing pad was purchased to compliment my new Bosca briefcase. Great quality and very handsome in look and feel. Thank you Bosca! The dark brown color is very rich in appearance and leather very high quality. The structure is thin making it easy to tuck in your briefcase. Very high-end product. Professional and high-quality product. Eye-catching in business meetings. I first bought a similar Bosca pad cover in 1990. I loaned it to my wife who misplaced it. After 25 years it still looked almost new. I look forward to the next 25 year with this cover. I purchased this item in Atlanta at Lenox Square in 1985 when I was just starting my career. Today I still use it daily and it has worn well. I believe I paid approximately $100. I would say a great purchase. This writing pad screams of good taste and refinement. I'm actually puzzled that people don't stop me in the streets to compliment just how fine the leather looks. I can tell that this is another Bosca item that will most likely outlive me. The leather is extraordinary and it just feels really good in the hand. I doubt another meeting will go by without my having this new addition close at hand. The monogramming was a great touch of elegance - and it's well done. I've had your typical "faux" leather writing pads but this one is the Rolls Royce - and you can definitely tell it is something to behold and cherish. The leather for this writing pad is just gorgeous, and it gets better with age. A genuine pad cover that feels and looks of fine quality. However, doesn't fit a standard sized pen and scratches too easily. I love my leather writing pad cover. I must admit that it could do with a slightly bigger pen holder as my fountain pen creases the spine however this is the case with most writing pad covers. The leather is soft and takes knocks quite well. Marks develop over time giving it character.